KIEV, Ukraine -- Escalating tensions with Russia sent Ukraine's currency tumbling to a record low against the dollar Tuesday, a move that could threaten the stability of the country's banking system and raise the prospect of losses for bondholders. 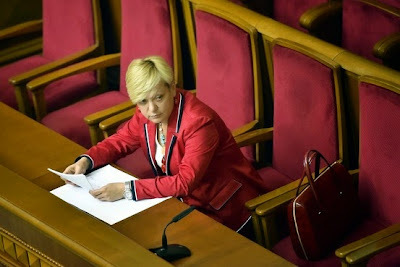 Valeria Hontareva, head of the National Bank of Ukraine, prepares to deliver an address at a parliamentary session in Kiev on Tuesday. The sharp decline this month ends a period of relative tranquility in the country's financial markets. A mid-April interest-rate increase by the Ukrainian central bank and a $17 billion bailout from the International Monetary Fund later in the month had soothed investor jitters. The bailout was aimed at staving off economic collapse after protests toppled the previous government. But the latest move down for the hryvnia points to investors' growing belief that more financial support will be required. In the past week alone, the currency has lost 6% against the dollar, driven by continued fighting in Ukraine's eastern region and worries that Russia's efforts to provide humanitarian assistance could lay the groundwork for an invasion. A weaker hryvnia increases the burden on Ukraine's economy, boosting the cost of the energy and other imports the country relies on and making it more expensive for the country's government and companies to pay back debt denominated in foreign currencies. Should that debt burden mount, it could strain Ukraine's financial system and push some banks to seek government assistance, investors and analysts say. That, in turn, would further drain the government's fragile finances and call into question its ability to repay its debts, they add. The price of benchmark Ukraine government debt has fallen 6% since the start of the month, to 90 cents on the dollar, yielding 9.243%, according to Tradeweb. Yields climb when prices fall. The annual cost of default protection on $10 million of five-year Ukraine sovereign debt has risen about 25%, to $1 million, in the same time period, according to Markit. A sustained decline in bond prices could spell trouble for big-name Western investors, such as Franklin Templeton Investments, which made large bets on the country in the early stages of its standoff with Russia. Franklin Templeton is the largest investor in Ukraine government bonds, with holdings worth about $7 billion. The firm's positions are predominantly in foreign-currency bonds. Franklin Templeton didn't respond to requests for comment. The recent fall in the hryvnia is "a significant move," said Steffen Reichold, portfolio manager at Stone Harbor Investment Partners LP, adding that it could lead to a costly recapitalization of Ukraine's banks. "One of the few rules of banking crises is that bank recapitalizations tend to always be bigger than you think at the outset." Stone Harbor, which manages $64 billion of investments, owns no Ukrainian local-currency bonds and holds less of the country's dollar- and euro-denominated debt than the firm's benchmark indexes recommend. Still, investors who bought Russian assets during the worst of Ukraine's crisis this spring are likely sitting on gains. Ukraine's benchmark dollar-denominated bonds traded at less than 80 cents on the dollar in February. And the Ukrainian government hasn't missed any debt payments, even as the crisis with Russia has escalated. After intervening to support its currency, Ukraine's central bank says it scaled back its efforts and is committed to a policy of a flexible exchange rate. While answering questions before parliament Tuesday, National Bank of Ukraine Governor Valeria Hontareva said the loan agreement with the IMF prevents the bank from actively supporting its currency. She attributed the latest drop in the hryvnia to panic. After jumping in May thanks to the IMF bailout, Ukraine's foreign-currency reserves resumed their decline in June and fell $1 billion last month, to $16.07 billion, according to the National Bank of Ukraine. The IMF said initial stress tests of the country's banking sector showed Ukraine might need to spend the equivalent of up to 5% of its gross domestic product to stabilize its banks if the hryvnia weakened below 12.5 to the dollar. On Tuesday, the currency traded as low as 13.14 to the dollar. "There was a definite reluctance to look at difficult questions" when the IMF stepped in to bail out Ukraine, said Tim Ash, head of emerging-market research at Standard Bank. "There was an assumption that the debt was sustainable, but now that looks a bit trickier to manage." Since April, the IMF has had to revise its assumptions about Ukraine's financial health as the fighting in the east, a major manufacturing region, dimmed the country's growth outlook and fueled state spending for the military campaign. "With no quick solution to the conflict in sight, even the revised program looks likely to be out of reach," said two economists at the Institute of International Finance in a special report on the crisis. The group, which represents nearly 500 of the world's largest financial institutions, said the financing gap could reach $6 billion to $9 billion, "with domestic banks in dire need of recapitalization." An IMF spokeswoman said the fund doesn't comment on exchange-rate movements. But fund economists are likely to have factored in short-term volatility in the currency. IMF staff have given a preliminary green light for the distribution of a $1.4 billion tranche of aid to Ukraine in September, though it still requires approval by the executive board at the end of this month. Ukraine's economy was facing a host of economic problems, from wide budget and trade deficits to dwindling foreign-currency reserves, even before tensions with its eastern neighbor ramped up this spring. Some of the biggest Ukrainian companies have recently shown signs of stress. Agricultural giant Mriya Agro Holding on Aug. 1 said it had missed payments on some of its debt and was considering a broader restructuring. "The lower the hryvnia falls, the more pressure will build on the banking and corporate sector," Andre Andrijanovs, a strategist with frontier-markets-focused broker Exotix Partners LLP. "We're just waiting for another big blowup. It could be in the corporate space, it could be in banking."